In case you missed last week’s announcement… Mr. Frugalwoods and I bought our homestead in the woods! In light of this revelation, I’ll devote a spate of upcoming posts to discussing every angle of our rapidly approaching homestead journey. Today’s edition of “all things homestead” analyzes the reasons why we chose the property we did. Future installments will address the financials and sundry other topics. Although we felt an immediate emotional connection when we first laid eyes on what would become our homestead, Mr. FW and I knew we needed to back those mushy feelings up with cold, hard data. And so, we commenced our research. In addition to the house and the land, we have a vested interest in the surrounding community. Thus, our prior-to-purchase vetting process was relatively extensive and included such factors as the local school district, nearby community organizations, and even the grocery store. While this might seem like an inordinately large number of details to consider, we intend to live on our homestead for years–if not decades–to come. This duration in itself is a novel proposition for us, as we both moved around quite a bit as kids and haven’t stayed in the same city–let alone the same house–for more than four years since before we started college (14 years ago!). Hence, the idea of living in one location for the long haul prompted us to make certain we loved it. Our research truly began four years ago when the first kernel of our eventual homestead destiny materialized and we began viewing and researching properties. These years of casual perusal gave us the framework to evaluate our homestead with at least somewhat trained eyes. And of course, we realize we can’t research every last detail, so there’s certainly a leap of faith involved. But, I’ve discovered that most worthwhile things in life involve some amount of risk. 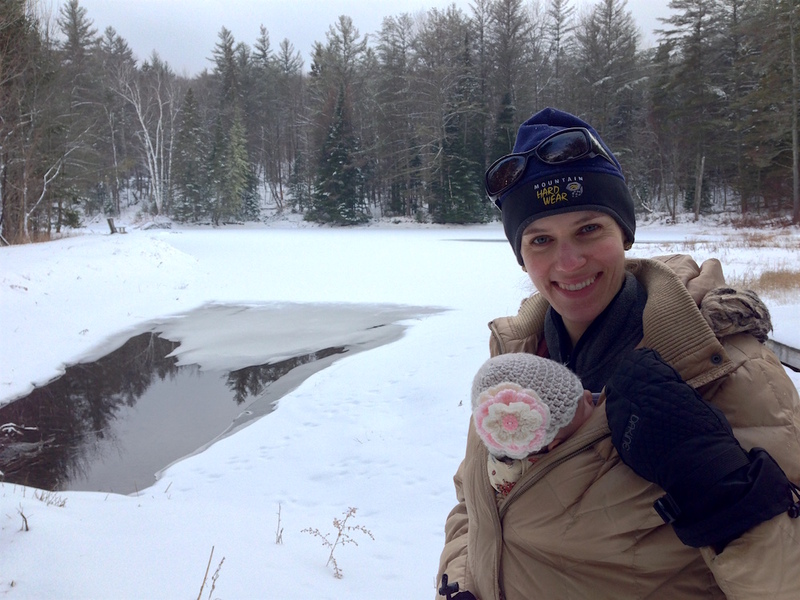 And so, without further ago, here’s the full rundown on exactly why we selected our homestead. We knew we wanted a fairly substantial amount of acreage and set our minimum at 20. The fact that this property has 66 acres was beyond our wildest dreams and expectations of what we’d be able to afford. 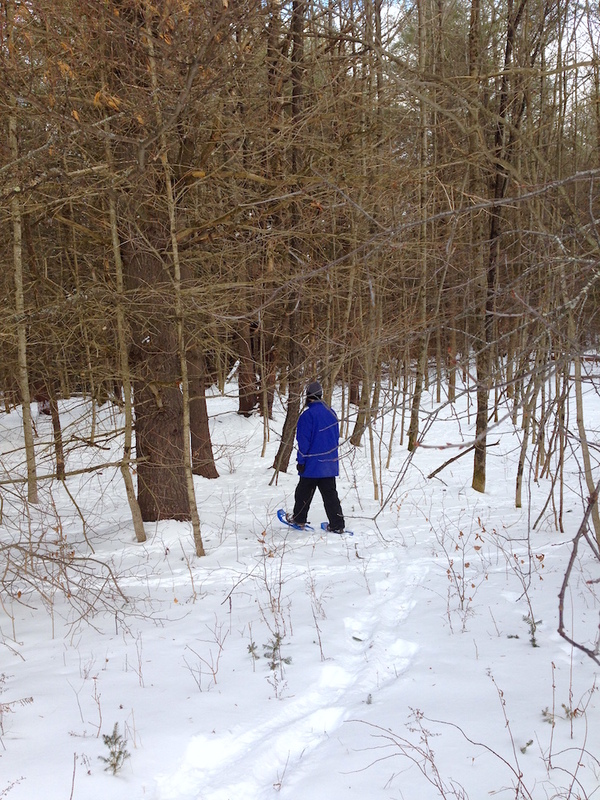 The vast majority of our land is forested, which was our desire, and the forest is in great health containing a diverse mix of hardwoods (think maple trees) and softwoods (think pine trees). Our land is also slightly sloping, which means we have splendid views from the highest points. Additionally, our front acreage is cleared pasture, which is a nice boon since it’s difficult and expensive to clear forest. We’re not sure what we’ll do with that pasture land, but we’ll work to keep it cleared in the event that we decide to graze animals or build on it. Folks familiar with land in the Northeast will be interested to know that all but 12 of our acres are in Current Use (the sections not in Current Use include 2 acres around our homesite and our front 10 acres with the aforementioned pasture). Current Use is essentially a tax break offered by the state on contiguous parcels of land greater than 25 acres–land in Current Use is taxed based upon its agriculture or forest usage, not on its market value. The advantage of not having all of our land is Current Use is that we can build upon the non-Current Use land if we so desire at some point in the future. At 2,300 square feet with 4 bedrooms and 2.5 baths, it’s larger and newer than we anticipated in our price range. Built in 1991 with custom wood trim finishes from a previous owner who is a fine woodworker by trade, the house is in excellent condition and only needs a few minimal cosmetic changes (new interior paint is high on my list), which we can do ourselves in the coming years. At some point, we’d like to upgrade the kitchen and bathrooms, but those are things we can tackle on our own somewhere down the line. Over the course of our search, we saw plenty of homes in need of extensive repairs and renovations, so we feel extraordinarily lucky that this place requires very little in the way of upgrades. The home has ample windows on all sides and provides wonderful views of the land, which will be perfect for keeping an eye on Babywoods while she and Frugal Hound romp around the yard. Something I fantasized having, which this parcel delivers, is an open yard enabling clear views from the house of the surrounding woods. This house is sited atop a slight hill, allowing us to look down upon the 2 acre yard, which is filled with berry bushes, mature apple trees, plum trees, and huge garden beds (which I look forward to failing at growing vegetables in). We’re thrilled to have mature apple trees and spent time pruning them a few weeks ago–hopefully they’ll bear fruit this fall! 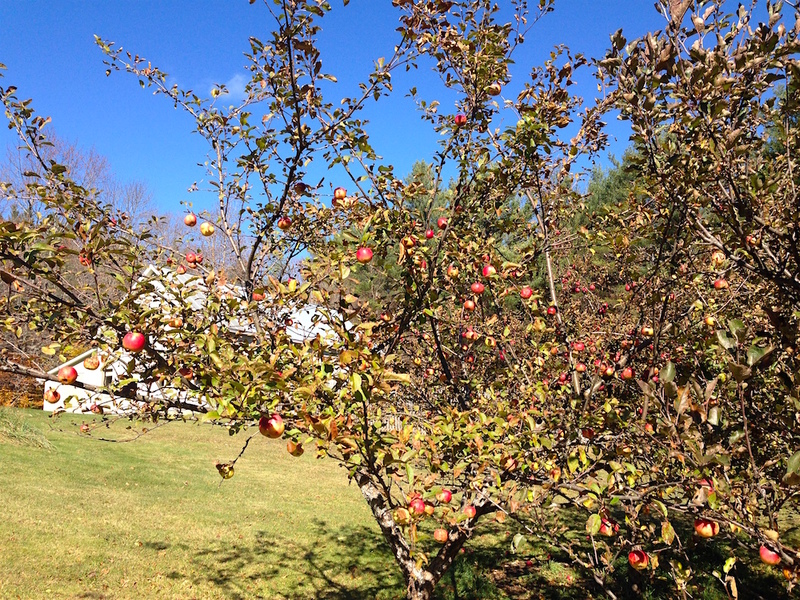 The trees were loaded with apples when we viewed the property in October, but last year was a bumper apple crop year, so we’ll see what this fall brings. The previous owners planted quite an array of perennials–including flowers and asparagus! The hitch is that we don’t know where anything actually is, so this year will be a time of discovery and garden map making. Mr. FW and I are novice gardeners (is there something even less qualified than novice? If so, that’s us); thus, our primary goal this first year is to map out where all the existing plants are, clear away weeds, and create a strategy for planting next year. I’ll also keep close track of our last and first frost dates to inform our planting schedule for the future. A water feature was a lark in our property criteria and we hoped we might net a little stream or brook. We certainly hadn’t banked on a whole pond! This pond is gorgeously scenic and not too deep, which should make for idyllic summer splashing. It also freezes in the winter for skating! As a Mommywoods, I’m pleased that the pond is a third of a mile from the house as this will make it easy to control Babywoods’ access to it. One property we looked at had a pond right outside the front door, which made me a tad nervous for our future toddler. It was on our dream list to locate a parcel with at least one outbuilding and this place delivers in a big way. There’s an 1,800 square foot barn and wood shop complete with water and electricity. Mr. FW is already salivating over the welding and woodworking he’ll be doing. Every weekend we’re there, he finds a reason to go tinker in the shop. I’ve never seen him happier, which makes me immensely happy. 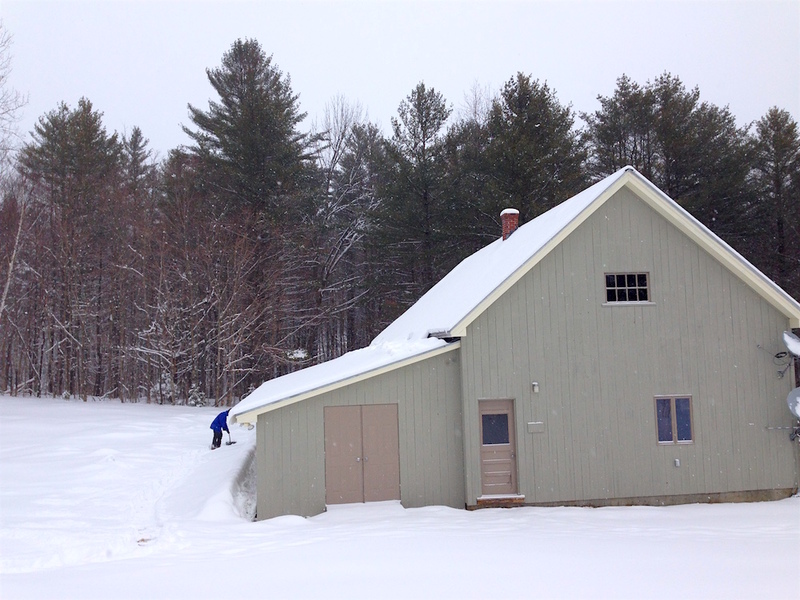 The barn also has a lean-to covered garage built onto the side, which provides the perfect spot to park our tractor (!!!! )–more on that soon–as well as store gardening tools. We had the septic inspected and it passed with flying colors (or rather, with no flying and no colors at all, which is what you want in a septic system). It helps that the previous two owners of the property were families of just two people–septic systems wear out more quickly the more people are, uh, using the facilities shall we say. For more on the thrilling–and endlessly appealing–topic of septic systems, check out Mr. FW’s Frugal Homestead Series Part 6: The Other End Of The Water Equation. Our home inspector ran the taps in the house for over an hour and never exhausted the well, which is a good sign of its virility. As a contingency of purchase, we also had the well tested for organic and inorganic compounds (nothing of concern was found). Curious to know more about wells and how to assess them? Mr. FW has the article for you: Frugal Homestead Series Part 5: Well, Well, Well. A major consideration with rural properties is accessibility. And we feel like we hit the jackpot: we’re literally on a state highway. Quite a few of the places we looked at were off of winding dirt roads (which could be a challenge in snowy or muddy weather, which pretty much describes most of the year in Vermont). Being on a state highway means that our access will always be plowed and well maintained. Plus, we can’t hear any noise from the road at the house as it’s 1) a quarter mile from the highway to the house, and 2) there’s just not that much traffic. Although we own a whopping 66 acres (I still can’t get used to that idea!!! ), our neighbors are very important to us. It would not be cool to live next to a gravel quarry. Fortunately, that’s not the case and our neighbors seem quite lovely indeed. Since we come with a Babywoods in tow, we wanted to ensure that the local school system is in good shape. I’m very pleased with the district we’re in as it’s consolidated (meaning several small towns joined together into one district), which makes for larger schools and greater resources. Babywoods’ elementary school is an almost brand-new building that’s a mere 10 minute drive from our home. Additionally, Vermont provides free preschool to all children starting at age three and this elementary school has a preschool, so she’ll be well acclimated to the school environment from a young age (sidenote: how awesome is Vermont!!!). I like that she’ll be knit into the school community before she even starts kindergarten. All of the parents we’ve met thus far are pleased with the school system and have only good things to say, which comes as a great relief to us. Although we could explore homeschooling or private education, Mr. FW and I are devotees of public schools for myriad reasons, including the fact that we both attended public institutions from kindergarten through college. One of our motivators in moving to a small town is the ability to deeply engage in local civic life and culture. We were delighted to find a vibrant community organization (a 5 minute drive from our house) that hosts weekly story hours for kids, monthly town dinners, talent shows, pizza nights, weekly book/cooking/craft groups, various potlucks, a snowshoe-a-thon (you better believe Mr. FW and I watched a bunch of YouTube videos on “How To Snowshoe for Morons Beginners”), and sundry other delightful events. There’s also a nearby farmer’s markets, baby-and-me groups, and other community ventures that we look forward to becoming involved with. What’s heartening to us is that, in the few short months we’ve been spending weekends in Vermont, we’ve already met and connected with more neighbors than we know in Cambridge. The warmth and friendliness of everyone we’ve met in Vermont has blown us away. I think we’ve happened upon a very special place in the world. To whit, we participated in aforementioned town snowshoe-a-thon and were happily inundated with friendly folks wanting to meet us. I’ve never felt so encompassed by a true sense of community and camaraderie. 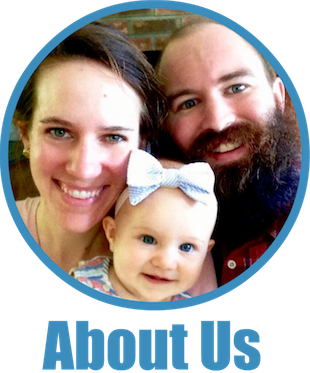 Something I don’t talk about very often on Frugalwoods is our faith, but it’s significant to us that we have a church home and we’ve found that in Vermont. We already feel connected and plugged into the church family and look forward to becoming more so once we’re moved up. In fact, we’ve decided to have Babywoods baptized at our Vermont church. While we wanted rural, we didn’t want remote. 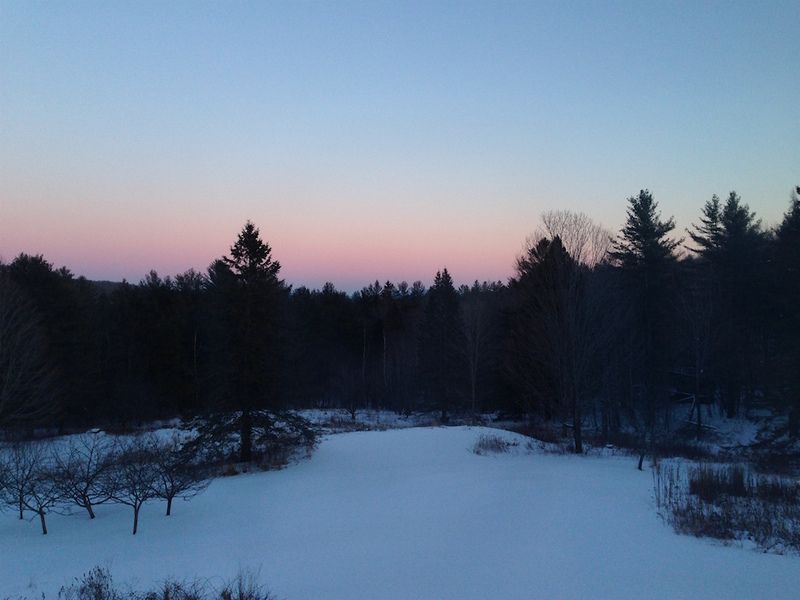 In addition to being a 2.5 hour drive (sometimes 3 with Frugal Hound and Babywoods… ) from our Cambridge home, our homestead is just 35 minutes from Hanover–where Dartmouth College, a large medical center, endless arts and culture, and every other service imaginable is located. Before purchasing this property, we scoped out Hanover and our nearest grocery store (we actually walked through and ‘faux shopped’ by price checking the stuff we normally buy). It’s our hope to eventually procure the bulk of our foodstuffs hyper-locally through growing it ourselves and buying it from our neighbors and the farmer’s market, but it’s good to have a grocery store back-up (you know, for my occasional candy corn obsession fix… ). I’ve saved a rather essential factor for last. 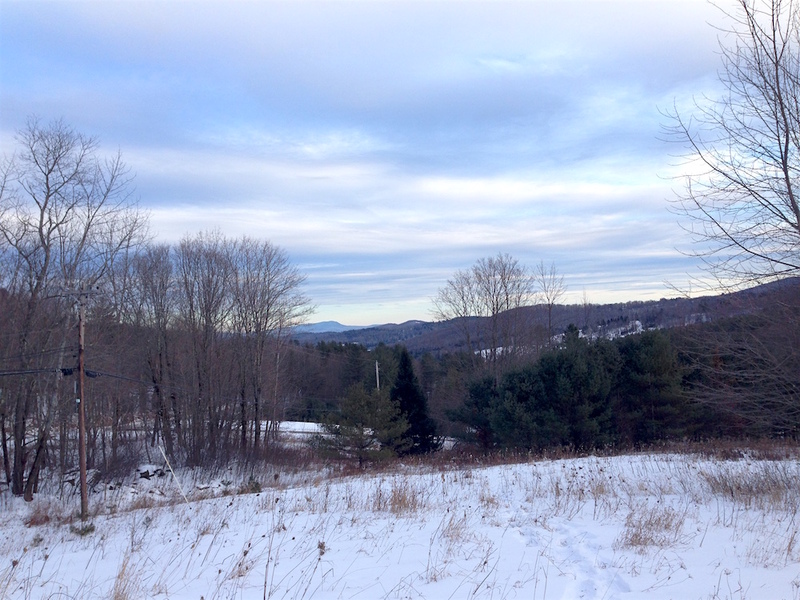 Believe it or not, good internet access is not a sure thing in rural Vermont. And this is honestly what sealed the deal for us, because… wait for it… this place has fiber-optic internet. Oh yes, we have better internet here in the woods than we do in Cambridge. Since we are heavily reliant upon the internet for our livelihood, our passions (hello Frugalwoods! ), and life in general (Mr. FW definitely used the internet to learn how to light our catalytic woodstove the first time), this was a crucial element in our decision-making. There’s nothing quite like being able to write while sitting in the woods. For me, that’s essentially the epitome of a dream. To be honest, the driveway gave us major pause. While it’s awesome that the house is a quarter mile from the highway for noise buffering, it also means that we are now the proud owners of a hilly, gravel-topped, quarter mile long driveway, which we are solely responsible for maintaining. We decided that the many, many pros outweighed this con, but it’s a rather long (and steep) con. In light of this con, we are now the proud owners of a Kubota L4400 tractor, which we purchased from the previous owners and with which Mr. FW will plow and maintain the driveway. As you can imagine, he was super disappointed that we had to buy a tractor… hah! Quite the opposite, my friends. It’s also yet another example of the awesomeness of frugality. The ability to pay cash for an unexpected purchase (while buying a house) is a great illustration of how frugality makes our lives easier. Or rather, the lack thereof. For mysterious reasons known only to the family who built this house, there’s no dishwasher. An odd omission in a 25-year-old home with a large kitchen. But, it’s not an insurmountable obstacle. Needless to say, we’ll be installing a dishwasher in short order. And in fact, as so often happens with home renovation projects, one thing may lead to another and we may need to entirely reconfigure the kitchen since there’s no good spot for a dishwasher in the current configuration. But that’s another project for another time. P.S. anyone wondering about my ardent love for dishwashers can check out this post. This is one of those things that I categorize as a simultaneous pro and con. On one hand, we eliminated a number of properties from consideration because we could see a neighbor’s house, but on the other hand, it would be nice to have a neighbor we could walk over and borrow a cup of sugar from (something we actually do with our dearest and closest Cambridge neighbor). Although there are plenty of neighbors within a few miles of us, they’re just not right next door. This’ll be an adjustment from our dense urban environs (where our nearest neighbor is literally inches away), but it’s a change we’ve chosen to make. A meaningful driver of our desire to live in the woods is having the space and freedom to do what we wish with our land, so it’s certainly a trade-off we anticipated. A discovery that comes as great relief to me is the fact that we’ve met several other families with babies who live within a 10 minute drive. And they’re so incredibly friendly that they’ve already had me and Babywoods over for a play date! Hence, I think once we get over the initial adjustment period, we’ll do just fine. We feel tremendously fortunate to have landed upon what is truly the homestead of our dreams. One key factor of this place that I haven’t mentioned yet is that it was well within our price range. And that’s paramount. We saw plenty of amazing properties online that were simply too expensive, and so, we never viewed them in person. Staying within one’s budget–even for something as mammoth as a home–is a central component to frugality and to one’s lifelong financial health. Saddling ourselves with a house we could ill afford might’ve signaled a death knell for our early retirement plans. By instead taking the road of waiting until the right property at the right price came along, we were able to comfortably buy it without compromising our other financial goals. I’ll address the financial nuances in an upcoming homestead mania post, but I wanted to close on this note since it’s so tempting to stretch the boundaries of one’s price range when house hunting (trust me, I know the feeling). But even dreams have a budget. How did you vet your current home? Have you found the place of your dreams or are you still looking? Update: check out the next installment in this story: The Finances Of Our City Rental and Country Homestead. And you bought a Subaru right??! Totally get the Vermont “feels” when reading this. Dishwashers and garbage disposals can be hard on country septic systems. Maybe that’s why the builder didn’t put a dishwasher in. Local cooperative extension services usually have great info for beginning gardeners. For what it’s worth, I swear by raised beds. Hey – now you live near a City that has the same Name then the City I live next to. Greetings from Hannover, Germany and congratulations on your new dream home!! We bought our first house in 2009 using a zero-down VA loan. We had no idea what we were doing, but there was a buyer’s agent who “specialized” in helping other vets buy houses through the VA loan program, so we thought he would be the best choice. We found a nice house and he had his buddy over to inspect it. He said it passed with flying colors, despite some septic pipes that were cockeyed coming out of the ground – not to worry, he said. It also had a buried septic and water holding tank, and was built on permafrost (permanently frozen ground). Each summer, the ground froze, refroze, and churned everything in it up. Over the years we’ve spent $25,000 in repairs to fix these issues, but luckily we removed most of the buried components from the ground so they shouldn’t be a problem anymore. Oh wow–sounds like quite the adventure! Glad to hear you’re in the process of selling–good luck! That is a pretty property, and it sounds like the community is lovely. If you aren’t too far of a drive from Mt. Sunapee (guessing you’re not from the description), there was always a wonderful summer crafty fest thing there that we enjoyed. If they still have it, it’s good fun. About the dishwasher…our 2nd home growing up was in the same area (NH side of the border though). We had no dishwasher as well, and my dad always said it was because of the well/septic system. We also tried to do only one load of wash a day, same reason. Maybe the previous owners thought the same thing? Good to know re. Mt. 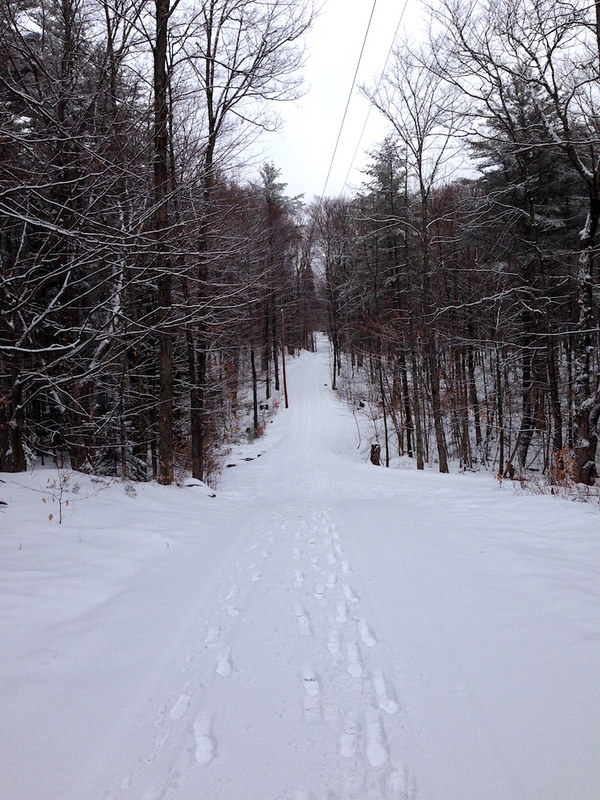 Sunapee–thank you! From my understanding, modern dishwashers are fine for septic systems as long as you don’t use a detergent with bleach in it. But we shall see! We have a septic tank and a dishwasher and have no problems. Absolutely beautiful and so many great features! I’m tempted to overwhelm you with reasons you should raise chickens, but I know you have to take it one thing at a time. I think it’ll be fun to see what starts growing this spring. We were pleasantly surprised by some of the perennials our home came with (we bought in the winter). What a wonderful story, congratulations, it really looks beautiful! As Mr. PIE and I consider our move in a few years to our mountain retreat, we have talked about growing vegetables and have even bought some snow shoes. If there is something below novice when it comes to gardening, then you’re looking at her! As for the snow shoes, thanks for the tip about YouTube! It looks great! Congratulations! Until the past two years, we always had a septic system. Initially, we did not have a dishwasher or garbage disposal either. We are a family of six. We installed both. Because our family is larger, we do laundry and dishes every day. To offset potential problems, we carefully maintained our system monthly and we had the tank checked every two years. In the 10 years that we lived in the house, we had the tank pumped 3 times. That is a lot, but it is was much cheaper than digging a new leach field or line or having to put in a new system altogether. So, my suggestion is just to keep a close eye on it the first year or two that you live there. You’ll get an idea about how your particular system functions best. Please tell me you bought a Subaru or AWD vehicle. I’m anxiously awaiting the post on the Frugalmobile, though not entirely hoping for her demise. My good friends live in Norwich and adore it. King Arthur Flour there has amazing baking classes for the homesteader interested in baking. Our cousin works at Dartmouth Medical and it’s such a lovely hospital so close by! Hopefully you never need it, but huge peace of mind! Also- I’ve grown up with septics and most houses in MA have them without dishwasher issues. We only run ours 1-2 times a week but my parents run their’s almost daily. I’ve heard the garbage disposals are bad (and I think you already posted on that) but they make septic safe soap, etc for the dishwasher. Good to hear–that’s been our understanding about dishwashers as well. Congratulations and Wow! You two never cease to amaze me — I would have never thought of “faux shopping” at the grocery store. This sounds like a perfect situation — you’re hard work and patience paid off! I can’t believe how a blog makes you feel like you know someone — but I feel so very happy for you both and look forward to hearing about life in Vermont! Oh, this sounds so amazing. You’ve almost sold me on living in the woods 🙂 I love living vicariously through you all. My wife and I just bought our dream homestead too… though with much less land, unfortunately. We moved into a farmhouse built in 1872 with 2 acres, a woodshop, and a pool. I already have plans to turn most of the property into a food forest, and use the woodshop to turn my hobby into a possibly lucrative side gig. I offer this as an idea which we have not yet fully walked through, so that’s a strong caveat. We live on a gravel road, with a gravel driveway, uphill. My hubby was going crazy with our tractor, keeping it covered in gravel rather than ruts! We have explored the idea of purchasing recycled asphalt (cheaper than gravel!) to make our driveway. We have purchased an old but reliable dump truck (to pick up the RA and make distributing it easier) and a roller. We are told that if we install the recycled asphalt in the summer (we live in VA), we can expect it to sort of “knit” together with the summer sun, essentially making an inexpensive “paved” driveway. Purchasing the truck, roller, and RA is cheaper than the cheapest estimate we got for creating a paved driveway. Our neighbors are excited to see how this goes, as we have agreed to use our truck/roller to do the road if things go well. When we finish, we plan to sell the truck and roller. Just an idea . . . . Very interesting! You’ll have to let me know how it goes–I’d love to hear how it works out for you! The house is lovely and surroundings are too. I haven’t read your ‘dishwasher’ article yet, but to be honest I don’t know why that contraption is necessary especially as you’ll not be working 8 to 5 (lunch break included LOL) when you must hop into your car at a certain time in the am in order to avoid the traffic jams, you can wash your dishes at a slow pace now. Of course, if you want to protect your hands you should wear some cleaning gloves. But considering that you’ve chosen rural life that includes planting, weeding, and harvesting your own gardens, I don’t think hands were not entered into equation and can handle dish washing just fine. We’re suburban people. We’ve lived in our house for almost 14 years and I can count on one (maybe two) hand how many times we’ve used our dishwasher. For us, it’s actually a storage place for children’s DVDs, VHS tapes (yep, we bought them at garage sales 10 years ago at 25 cents each before our 1st child came along. The tapes were watched by both kiddos for good 6-7 years), popcorn packages and some sponges. This way the kids didn’t need to climb on the chairs to reach for a movie and/or popcorn. Congrats! Looks beautiful and I love it! All I can say is “AWESOME!” Growing up in New England, all the things you talk about remind me of growing up. What I took for granted now growing up in the sticks, is something I may aspire to in the next 10 years or so with my own homestead. Thank you for sharing. What beautiful woodwork! And the windows in the kitchen are to die for. Course I realize that Vermont winters can be cold and that the windows could lead to a significant loss of heat but you guys will figure something out. I would love to be having coffee by those window in the fall! I love reading your blog. Thank you for sharing your life with a bunch of strangers who are somehow becoming your extended family. I think we are all hoping for wonderful things for you and your family. Mr. FW may be pretty happy in his workshop, but you are looking pretty happy too! Your homestead is just beautiful! What lovely land, and your home is beautiful. Looks like a Vermont dream-come-true! I agree with Marion about dishwashers and garbage disposals being hard on country septic systems. I know Mr FW will be studying that on-line. Wow, what a beautful home and community! It seems just perfect for you. You just realized a dream I had when I was younger. To live on acreage and play with the earth…my earth. I was never brave enough to take the leap and transition from “city” girl to “country” girl. And now I think it’s too late. At nearly 60 you think differently about what is important when buying a new home. 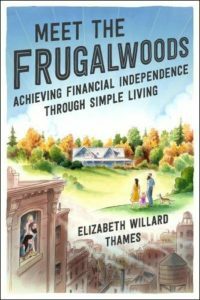 I’m so glad you and Mr. Frugalwoods had the courage to do this now and write about it because you might inspire others with similar dreams to take action while they are still young enough to handle such a big property and be remote from services. I’m not crippled or anything, but I’m sure not in the shape I was at your age and your property would either get me fit or kill me! Ree….I hear you. I’m 60 also and moved to this lifestyle at age 50. I do love it, but you have to recognize what you can and can’t do anymore and what’s important in your home as you age. Well said, Bev. Thanks for pointing that out. I love your story! Okay…where do I start. Seriously, it’s incredibly beautiful, and, just as you said, nearly perfect. I couldn’t agree more. I think Marion’s comment on the dishwasher/disposal being hard on septics is a valid point, and one to consider. Although, we’re on a septic system, and we use both, but not often. I’m weird, but I like washing dishes by hand and gazing out at our quiet woods. But that’s just me. Yes, your long driveway can be a problem, but I don’t see that for both of you because you both are going to be working from home. It’s one thing when you have to be out the door with kids in tow at a certain hour to be at work on time when there’s a heavy snow coming down or has been all night. You are both free, so to speak, and you can plow as you need to, all day long, whenever. We also own a Kubota tractor, 3130, and it has a front-mounted snow blower, and my husband plows our long driveway and private road himself. We call our tractor “Baby”, as that is what it is to him. He loves it more than me!! 🙂 It’s not the plowing that’s difficult, when you love the cold and snow as you both do, but it’s the wind blowing in your face that makes it tough. He wants to trade in ours for one with a cab…story for another day! Just buy markers at the hardware store to mark the road for safety and keep within the boundaries, and you’ll be fine. It’s a wonderful feeling to be so self-sufficient, something I truly admire about Vermonters. This city girl has learned a lot of self-sufficiency since moving here. I don’t even recognize my old self anymore. The lifestyle is wonderful, but it can be hard work, but if you enjoy how you’re living, it’s so rewarding. You see, you both knew what you wanted with all your heart and are willing to do what it takes to make it work. I came here for the love of a man and learned the lifestyle second. I was the most clueless person on country life there was. I can’t imagine going back, however. Well, getting very verbose here…..look forward to new posts and congratulations again. Please feel free to ask me any questions if you want, I’ll try to answer as best I can. Oh, your barn is WONDERFUL. Yes, I see Mr. FW tinkering/working in there all day long. The house is wonderful. 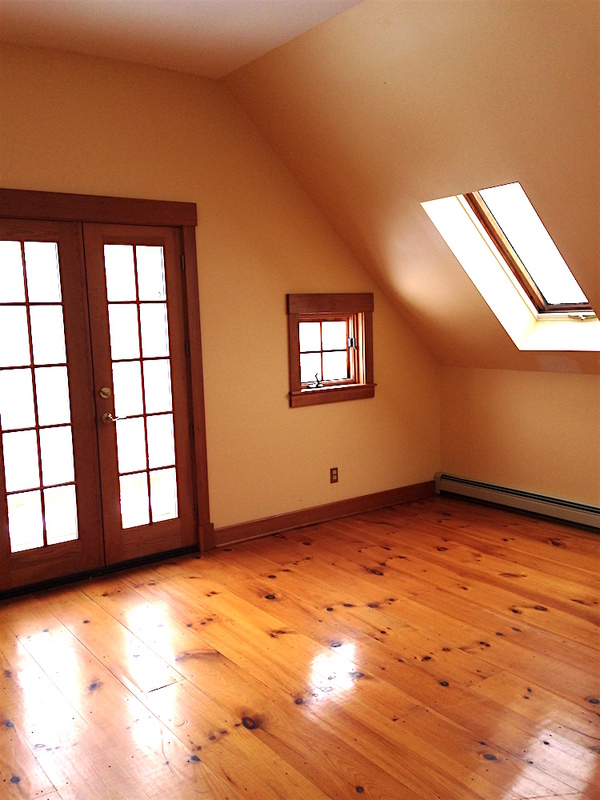 I especially like the floor in the master bedroom. Much happiness to you all. 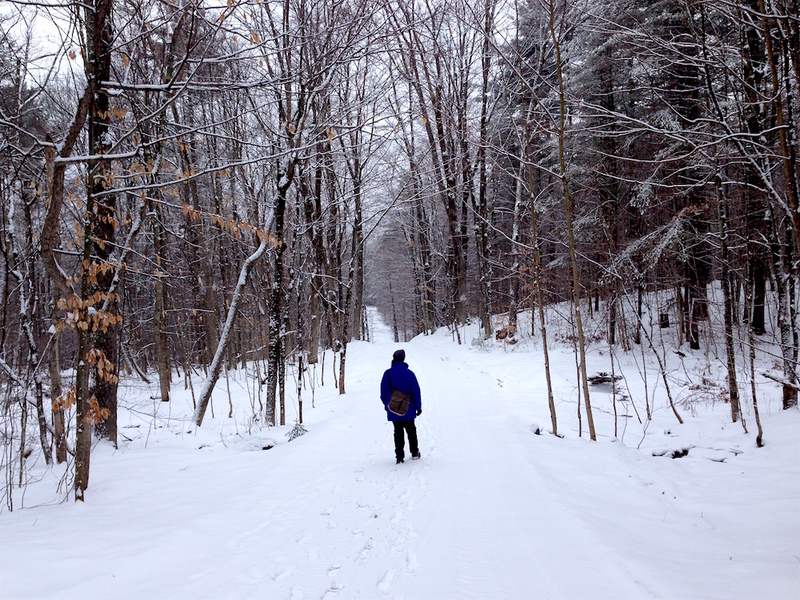 How much snow does Vermont get? The driveway is a little scary. Have you asked your neighbors what it will be like to plow the driveway during/after a bad snow storm? How do officials and residents handle the cleaning/plowing? Do Vermont schools close the way they do here in MA? Sorry for all the questions, as a city girl this is all fascinating to me! Congrats! This house is amazing. I also live in the Boston area and my family lives in Vermont, so I understand what a big change this is. I dream of someday escaping the city to a place with a yard and some privacy. Thank you so much for sharing the details of your life and how you reached this point. You two have inspired me to start living more frugally! Dishwasher runs to greywater – more maple trees! – garbage goes to chickens & compost. We run our dishwasher nearly every day and also have a septic system. No problems at all, and the house is 10 years old. It sounds pretty ideal. Everything sort of came together. I won’t say you “lucked” into it because you clearly spent a lot of time scoping details and criteria of the purchase and then doing your due diligence for years. This property hit your criteria and you had the wherewithal to execute and snap it up! Kudos to you. It looks beautiful (even through my mostly city slicker eyes). The schools are one concern I would have, but it sounds like you are set in that regard (our elementary school is also 10 minutes away, though that’s on foot; 1 minute by car). And that preschool sounds amazing. We have a 4 year old preschool at our neighborhood elementary school, but it’s by application and more focused on kids who really really really need the extra help before starting kindergarten (not sure the criteria they use for that decision though). I threw our name in the hat, so we’ll see if we win that lottery. You’re literally selling me on moving to Vermont! You mentioned church–I would be very interested in a post about your faith and how your faith impacts your frugality. Perhaps some thoughts on Dave Ramsey, tithing, vocation and how that connects to retiring early, etc. Although I do understand why it is a topic that feels controversial enough to want to avoid. As always, thanks for the wonderful posts! Also, while I certainly don’t need to know how much your property cost exactly, would you mind giving us a ballpark estimate so that I can get a sense of what accomplishing something like this would cost? I’m used to Boston-area prices, so I’m trying to get a handle on whether a large property in Vermont is easier to come by. Are we talking about $0-500k,$ 500k-1M, or $1M+? Great decision making information! Some of those types of criteria hit home for us. Interesting to see the differences in what was important, or in our cases a “given”. For example, internet. We’re in a very populated area so weren’t concerned with it. Our factors: condition of house’s structure and cosmetics, relatively newly renovated but not too new, backyard, garage and distance to both of our jobs. Very important: the smallest house on the block. As time goes on my wife and I keep bringing up how we love our home. The neighborhood, the view, and the access to outdoor activities were things we started to discover the longer we live here. The one downside: price. Other than moving to a different part of the country I don’t think we could have found a similar home for less money. LOVE the homestead and can’t wait to hear more about how you got here! We lived in an apartment for 2 years that didn’t have a dishwasher and I actually found hand washing the dishes to be therapeutic. I would play music and just kind of zone out to the running water and accomplishment of getting them done. And I definitely feel your pain on that driveway. We had a similar situation in a home we lived in for a year and clearing the snow was a struggle to say the least. Fortunately we had a mild winter the year we lived there. So wonderful you’ve found your homestead! I’m so looking forward to reading about all your new adventures in gardening, parenting, and making your new acres your new home. You two are my inspiration (though I don’t think I’ll go quite as rural someday…) and it’s amazing to follow your journey! How glorious! You might ask the person you bought your house from to rough out where various perennials are and any other things in the garden that might look like weeds in early spring but are not. I have been on both the giving and receiving end of this favor and it is lovely both ways (I am thrilled when I know the new owner wants to maintain the plants and am happy to oblige). On gardening, your neighbors will be a great help but also get to know your County Extension agent. She or he will be both directly helpful and also point you towards really good, research based websites that are suitable for your microclimate. Their services are completely free! That place looks amazing!!! When can I move in?!! Congrats on the purchase – I’m sure that will be a great place to raise Babywoods!! This looks wonderful! I strongly agree with including community and neighbors on your list of features to consider, and it sounds like you’ve found a great location for those things. We love our house and jobs, but I struggle with the lack of a close neighborhood community, especially other people with young kids. Too bad Zillow doesn’t have a “fun neighbors” search filter! One tip for you. Because you are novice gardeners, don’t pull anything until you know for sure what it it! The biggest mistake nubes make is pulling out plants they think are weeds only to discover later they made a big mistake. I can’t tell you how happy I am for you and your family. What a (nearly) perfect place you have found. The place where we finally decided to settle down took a lot of trial and error (and who knows – maybe this place is only temporary too!). When tiny Eivy was born, we traveled the world for a year just because we could – hubby worked from home and I had quit my teaching job to care for tiny Eivy. When we returned to the states, we bought a house in a co-housing community and lived there happily for several years, but when the market dropped, we couldn’t pass up our opportunity to buy our current home. Its in the most family friendly neighborhood, excellent neighborhood school, walking distance to EVERYTHING. This was key. We have one car that we try to use as little as possible so being able to walk everywhere was key. Although, listening to you talk about a homestead in Vermont is putting ideas in my head! haha! Yea – we have a crazy streak in us. We lived for six months in Magdeburg Germany – a little town in old East Germany since we knew a couple of people there. Everything was super cheap. The economy was still recovering so our rent was $200 a month. We bought bikes when we got there for about $20 each and rode everywhere so transportation was basically free. Food was about half the cost of what it is here. We saved so much money during that time even when you consider the cost of airfare to get there. From Germany we traveled through Ireland using couch surfer to stay for free with locals. We never had a single bad experience. In face, the people we stayed with were so warm and welcoming and showed us around. We try to pay that forward now whenever we can. Then we flew back to the states and visited friends and relatives for another few months. Our kid learned German (although she has forgotten it by now) and became an amazing traveler. What a fabulous property! Sounds pretty ideal, so happy for you guys that everything have come together. Anyway, that was a big debate in our property search. I really wanted the privacy of being back from the road, and we found an amazing place that did have that. But the 40 acres was set back from the road on a 5 acre, thin 1/2 mile strip. We would have had to build a driveway, get electric lines all the way back there, buy a tractor, and then maintain the drive. We decided against it, and bought a house that’s right off a small, quiet road. I think it was the right choice, but I still mourn our lost privacy. The house is in pretty rough shape, so we hope to build a new one in a few years set back a few hundred yards. Of course that was pre-crash. Post crash price would have been 2/3 the price, and right now it’s *almost* back up to what we paid for it. Ah well. There were many things we wanted that it didn’t have. Like a nice kitchen. A dishwasher. A second bathroom. A garage. A decent school district (we didn’t have kids, so it was not on our radar.) However it did have lovely build in bookshelves around a picture window. And way too many trees on a 5300 sf lot. It was built in 1947 and pretty sturdy though. We fixed many of the issues – removed the excess, dead, and dangerous trees. Husband built new cabinets for the kitchen, allowing for a dishwasher. Over the years: insulation, new windows, new roof. Soon: new sewer line to the street. While the house is feeling rather cramped with the addition of two more people (our 10 and 3 year old boys), and I’d give my left big toe for a second toilet, it works for us. I like the neighborhood, despite the school system. Our son attends a different public school (our local school is 1/2 mile down the hill, the one he attends is 0.7 miles up over the hill). While I constantly consider “trading up” to a slightly bigger house in a better school district (for only another $100,000), I cannot do it. My tribe is here. Our neighbors, while close, are fabulous. My kids have friends just across the street with whom we carpool to school. Across the hedge are two boys only 9 months older and younger than my younger child. Our neighbor in back (did I mention that the original house was on a double lot, and so our driveway goes to someone else’s house?) is great. He just brought over a bunch of lemons, plus meat from his butcher – chicken, steak, and crab legs. I kid you not. When we were on vacation, he had a bunch of extra salmon for us (were unable to enjoy that from Utah!) Every Sunday our ‘hood has a potluck in the local park. Anywhere from 3 to 9 or 10 families. What a lovely house! It sounds fantastic! Great that you won’t have to make any immediate changes. I believe in living in a place for a while if at all possible so you can see how you really want to use the space. I’ll be interested to hear how your gardening goes! I am really interested in growing some food and maybe keeping chickens, but Mr. FP likes to travel, so I dunno. Public preschool is great! I have to pay on a sliding scale (at our income level, this works out to a truly amazing deal) but my kids have been so happy there. Kindergarten will be old hat to them. Big Brother is in a full-day pre-K so he gets “specials,” including a dance class. He gave me a very concise, comprehensible lecture about the difference between locomotor movement and non-locomotor movement, complete with demonstrations. I love seeing their worlds open up! I’m not sure if you are monetizing your blog because I don’t see ads on it and I don’t know much about it. 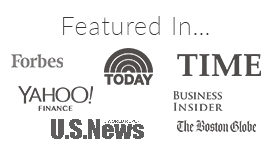 But if you are and want some more traffic, you might want to post on moneysavingmom.com. She has a huge readership. I’ve been reading her blog since the beginning, several years ago. Again, I don’t know how you would go about it. I started reading the latest post on it (The Real Secret to Financial Success) and it reminded of your blog, which I love, by the way. Amazing! Seeing you guys achieve your goals and dreams is super inspiring. My siblings and I grew up on a pond, and it was FANTASTIC. Besides swimming, boating, and skating, we all learned so much about the local wildlife through natural play, to the point where we’re now all amateur naturalists 🙂 And once instilled in you, that love for the outdoors doesn’t leave when you grow up–it’s the greatest gift our parents could have given us. It looks gorgeous! Congratulations! When we lived in a snowy “holler” up in the mountains, our neighbors with long or steep driveways simply had little sheds at the end towards the road, where they parked their ATVs and left things like snowshoes and sleds to load the kids and groceries on. I used to think it would be fun- just a nice little hike at the end of the day! So you’ve got options besides plowing it all out every single time…. Thank you! Yes, in fact we’ve already practiced the art of “parking at the top” and walking to the house a few times ;). It’s good to have that as an option! Congratulations. What an absolutely stunning location. And the house looks perfect, inside and out. Just curious though. 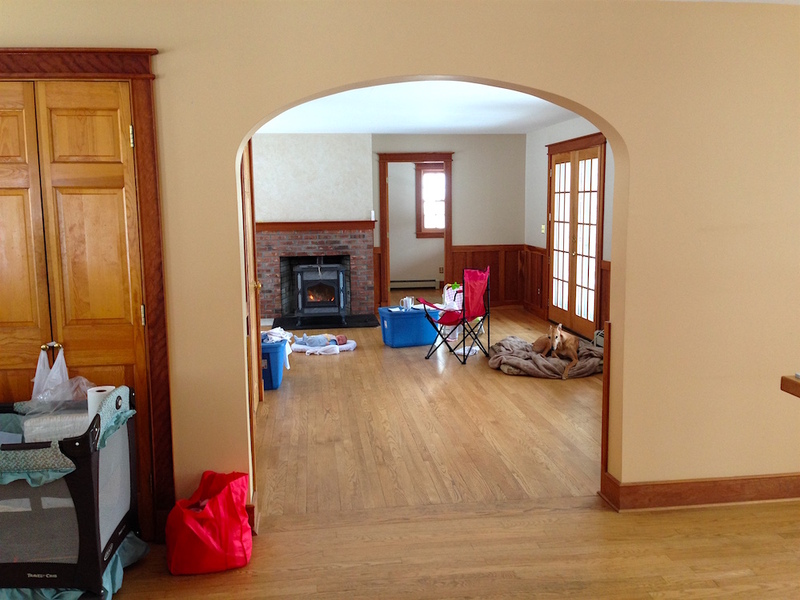 What were the previous owners reasons for leaving such a gorgeous home(stead)? Congratulations Frugalwoods! I lived in and around Hanover for 8 years in my youth, miss it terribly, am excited for you to get to know such a beautiful place! Looks great, tho all those windows make me worry about heating costs/effort(wood stove?). – Solar/windmill/battery for power outage planning? – Total retirement, or work from home or shop? – sheep to mow that lawn (goats chew down too far) & provide wool, milk, & meat? Just beautiful! Thank you for sharing your lives with us all. My dear old 84 year old dad always says to avoid pulling anything out of the garden for the first year you are there so you can see what comes up. (Except for weeds..)..I’m sure if you post photos up online people will be very willing to identify what you have. Enjoy! I like other people have never posted on a blog except yours.. but here I go again, what a beautiful house, I am so excited for you and I don’t even know you.. Gardening is not so hard, I am giving away some gardening books if you would like some, was about to give them to Good Will.. but I am a city gardener, I don’t know a thing about gardening in VT. That kitchen is hard to rearrange for a dishwasher, but it is beautiful.. too bad you could not just take out a window and put the fridge there right? Congratulations, you guys rock..
You’ve left me speechless. Honest! I am totally happy for all of you! 1/4 mile driveway. I call that total privacy and, like the pond, something Babywoods won’t be playing near. AND – do you have any idea how many tens of thousands of dollars it costs to run power lines that far from the main road if you had decided to build from scratch!? You definitely scored. Inspired by your recent DIY plumbing exploits, we just managed to shoehorn a dishwasher into our original 1940 kitchen. I’m sure you’ll find a way to make it work! But how close is the nearest Costco? 🙂 Will you be switching to BJ’s? Or making occasional trips when you’re in Boston? Stop making Vermont sound so good! It’ll get crowded and overpriced if you keep this up! Speaking of living within inches of people, I could fill a book with the conversations, arguments, and hip hop demos I’ve overheard from our neighbors. But as much I like to think I could live so remotely, it would probably encourage my worse hermit-like instincts. I might need the annoying neighbors. Your place looks and sounds awesome, and perfect especially for you. Once you get settled in let us know. We’ll update our passports and head over from New Hampshire for a visit! I have really enjoyed your last two posts on the homestead and have sent both to Poopsie. Please post some more great pictures of her! Her fans miss her. Congrats again on the homestead! Congratulations! Those dormer peaks look Canadian. Don’t worry about the dishwasher now. Without it you’ll have more time to look out those wonderful kitchen windows and conjure up your next FW post!! Congrats, once again! Thanks for sharing, it looks lovely. I love how the septic system is in your list of criteria. Enjoy! I’m just so thrilled for you both! Love hearing all these awesome tidbits! This sounds amazing! What a beautiful house and property! Super curious where you guys are (though understand the privacy need, haha). My grandparents had a house in Tyson, VT (mail-wise, Ludlow), and they lived there until I was in high school, so I spent a ton of time in Vermont growing up. Will you be buying a tractor with a snow blower , a truck with a plow blade or just hiring one of the neighbours? I see that you bought a tractor. Smart move. I am not sure how I missed that on my first read of the article. Sounds like you bought a place close to where my husband grew up in Vermont. We’ve actually opted out of the free preschool because of the formal assessment requirements that came with the legislation. I’ts pretty much perfect! Even the cons are also pros in some way, how could you not pick this property? I’ve just fallen in love with your house a bit, which is weird. Congrats. I’ve been following your journey for quite some time and can’t believe this is the first time I’m commenting. It’s been a joy to watch/read your journey. I grew up in an environment where we either grew, raised, and hunted for almost all of our food (well…we lived in Alaska, so a lot of the fruit except berries had to be purchased). I read Animal, Vegetable, Miracle a few years ago and it resonated a lot with how I grew up. It’s about a family that moves from the city to a farm with little experience. You might want to give it a read…it’s an easy read, so shouldn’t take up too much of your homestead move time. I also love Animal, Vegetable, Miracle – it’s one of the reasons I initially got interested in gardening. And like the Frugalwoods I had no background knowledge or experience to draw from!! However, gardening is now one of my favorite hobbies since it is very rewarding to start something from a seed, watch it grow, and then “shop” in your garden for dinner! It’s also been fun to try storing produce to enjoy your garden efforts year-round. We use our basement in our 100 year old house as a somewhat functional “root cellar”. In fact, just a few weeks ago we finished up the last of our carrots and winter squash! There are so many resources online to help beginner gardeners, but the key for me was to start small with easy to grow vegetables and herbs. Then as you get more comfortable, start experimenting each year with a few more varieties. I am a bit jealous that you already have gardens and fruit trees! We have been slowly converting our small yard into our version of a “urban homestead”, but we have a few years before our apple trees and blueberries will really start producing. Hugels are super easy (and frugal!) to build with items you already have on your property (even in our urban area we sourced everything from within our neighborhood). They are also great because they warm up the soil as the woody material breaks down (which is nice for us in our short northern MN growing season) and they retain moisture better than other garden types. this is thrilling! I’m happy for you and a teensy jealous! Two thoughts: since you mentioned baby and pond in the same sentence-would yall do a baby fence? I don’t know baby precautions. I’m curious about what, if any changes you choose here. My last comment-don’t forget about Llamas and Alpacas! THey are cheaper than adopting a dog (which why not, get a wee fleet, you have the space). Have you seen Chewy or Rojo? Babywoods would lose her mind! What type of septic system is it? My mother added a dishwasher to her house many, many moons ago, by pulling one of the cabinets next to the sink. We added a countertop to that cabinet to use for more counter space in our second teeny grad school apartment. There was just wasted space, too small for a table. We’ve still got the cabinet, now in our basement for storage. Our current kitchen has the sink on the bottom of a narrow ‘U’, and the dishwasher is on one of the legs. the first cabinet after the corner, so it doesn’t have to be on the same wall as the sink. Depending on the functionality of the cabinet you need to pull, you might end up swapping it with one of the others, so you keep a drawer stack or whatever. Wow. This looks amazing. You have found somewhere with enough land and close to nature allowing for solitude, but close to civilization for the “essentials” when you want or need them. Ok this is awesome! So glad you frugal wierdos found a place inVt! Check out Lake Morey, beautiful place close by. Regarding your driveway, one piece of equipment that is totally worth investing in is a GS15 or GS25 Series Grading Scraper built by Land Pride. It attaches to the 3 point hitch on your tractor and regrades your gravel driveway. I am a landscaper and will tell you this thing is amazing because you will never buy gravel again. It is very fast and easy to use and I can’t emphasize enough how worthwhile it is to own. Coat about 1200. Occasional reader but I’ve never posted a comment. Just wanted to say congrats and welcome to VT! I live in VT (Burlington area) and it’s quite a special place. The house is beautiful–looking forward to most posts about it. It sounds perfect. You always have to give and take some things when looking for a house, but the things you had to compromise on are small. Our house is a little further from work than I would have liked, but it had all the other most haves 1+ acre (we have 3), near water (less than 5 minute walk to a lake we have access to but don’t pay the lake front taxes! ), newer/upgraded (house was built in 2008 by someone who planned on living here forever, but life changed), neighbours not too close (behind us is private bush we have access too, across from us is pasture, we live on a private road, aptly named Paradise – with 7 places, half are cottages). I know you are going to love your home! Hi — We, like you, saved a lot of $$, retired early (alas at ages 56 and 60, not thirtyish) to 68 acres in the country with pastures, hiking trails, big gardens, vineyard, 4,400 sq ft house which we love. Now 18 years in we have to hire some help but that has not been a problem. I have two comments on your dream property. I am not sure that running a household tap for one hour really tests a well. Our well can fill a 48,000 gallon pool in three days and still keep going. We irrigate with our well water. You might use your pond. Secondly, we have recently had some unpleasant surprises due to the fact that we had certain things that needed annual maintenance of which we were ignorant. These were our generator and the filter on our well. We knew to have our HVAC units serviced annually but they were the only thing we knew about. Do not know what you have on your new place or your old one that might need this or whether you could learn to do annual service/checks yourself but you might look into this. Best of luck in your new place. I hope that you are as happy with the country life as we have been. Your homestead looks and sounds wonderful – congratulations!!! We live in our first house, and having grown up not in a development, I was adamant that we stay away from them. I want neighbors, but I don’t want to be so close to them that they’re right there when I step outside, and I feel like I have to chat all the time. I value privacy a lot. 🙂 We live on 2.5 acres, with woods on one side, and a neighboring house next door, but separated by enough trees that we can’t really see them in their year three seasons of the year. Now that I have a child – an only child, at that – I see the positives of developments. I have to drive my daughter to friends’ houses, rather than just letting her run outside and see who’s available to play. While I still would not want to live on a small lot with neighboring houses in clear view, I now have a more balanced view of living in developments. There are some in our area where the houses are on larger, partially-wooded lots, and I would consider a move to such a place, some day. I actually like your house and the place! It feels so cozy. I would totally enjoy life if I live in that kind of environment, Frugalwoods. As a fellow Cantabrigian who moved to Vermont about a year ago, let me start by saying welcome! 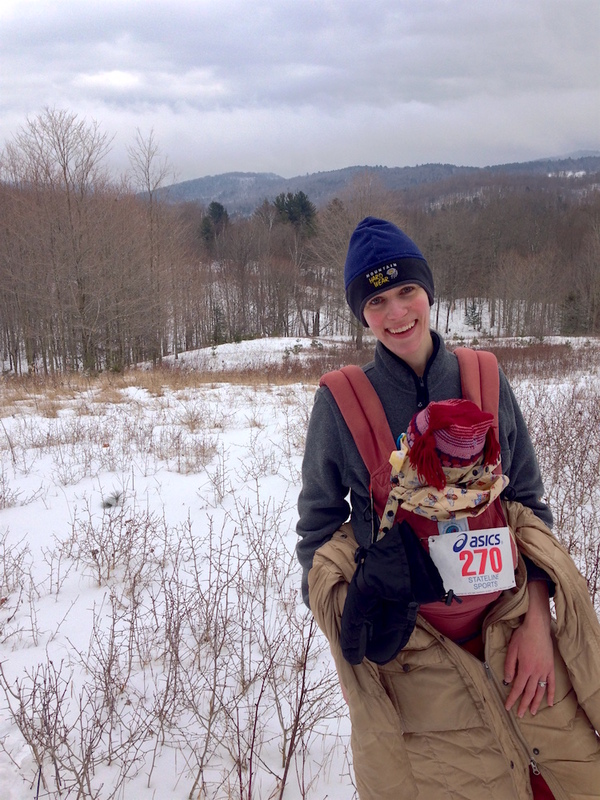 Vermont is a wonderful place to raise children (though I do miss some aspects of city life.) I’m not sure where you’re located but PFOA has been found in a number of wells in communities in southern Vermont. It’s not typically tested for and it is a known carcinogen, so you might want to make sure your well water isn’t contaminated. Also, just to clarify, Vermont doesn’t provide free, full-time preschool to every Vermont child. Our universal pre-k law only provides 10 hours per week for 3, 4 and 5 year olds for a total of two years. The funding is a little over $3,000 per year and can either take the form of a voucher for use with high-quality private pre-school providers (with parents paying the balance of tuition) or the form of public-school-sponsored pre-school. If your district is offering more than the ten hours per week, it’s coming from local education funds. The $3000 grants make pre-school much more affordable to Vermont parents, but not free. Our dream situation is almost completely the opposite of yours as we want a small place with low maintenance in a city, but I can definitely appreciate the arduous searching and knowing what you want. Great sum-up of the surroundings and the school system in the area, Fiber optic internet? 😮 that’s the best! I wouldn’t have expected that great for you guys! the property looks great and you’ll have plenty of land to walk around. Seams like all the stars aligned to provide you with this opportunity within the budget. Will you brake down the financials? keep us updated with more useful details. Congratulations on your new purchase and plans! Holy moly is this awesome. A great house to grow into, the perfect piece of land, great schools and social capital. And in your budget! I’d love to do something like this (actually have looked into alternative/eco-friendly building,) but land is scarce in the district we’d like to move into. I’m with you on only doing what you can afford. We’re putting off buying so we can save more money. We’re looking to buy and hold (likely forever,) and while we don’t want to compromise TOO much for that reason, we also don’t want to make ourselves house poor in any way, shape or form. Frugalwoods! I like how you chose your homestead. Those criteria you mentioned are really good! I know for sure that you’d settle with this decision and hopefully you just enjoy it for the rest of your lives. Love the property. The house looks like it’s in amazing condition. I’ve been scoping out properties for many months (planning for the future) and everything that I see in the price I’m wanting to pay is never as nice as yours. Luckily, I have a super handy hubby that could take care of that, but he rehabbed the home we’re living in now and I’m not sure he’d want to do a full rehab again. It’d be nice to eventually find something we could just move into and not have a ton of work to make it livable. Congratulations! You have achieved something so special that most people wouldn’t even dream about! We had a dream of about 3 acres on which to build our dream home–lean and green (minimal, modern, energy efficient). What we found was 35 acres of virgin woods! The ideal home site ( overlooking the Missouri River!) is 1/2 mile from the road. Our journey to build has been a series of ‘one step forward, three steps back’! The latest was endangered bats nesting in trees where we wanted to locate our driveway! We love bats for all the mosquitos they eat, and they need to have homes, too! So, with the help of the team of professionals we have put together, the bats will have nesting sites and our driveway will be installed. Even with the delays, neither of us regret our purchase of this property! Just spending time walking in the woods or watching the River has been such a pleasure for us ‘city folk’! Once our home is built, it will be difficult to drag us away. We will encourage family and friends to come to visit and enjoy our little slice of heaven. Like you we did our due diligence, location of the nearest hospital and doctors on staff there, grocery stores, fabric stores, etc. We even considered if there was good site lines for pulling out of our driveway! We had lived in the he area previously, but, things had changed in the 20+ years we’d lived elsewhere. It will b with great interest that I follow your journey, I wish you and your family all over he b st! My fiances parents built a house in the country with a huge kitchen and no dishwasher to conserve water. An item his mother wishes they would have never omitted!! Thanks for your blog. I started following you a year ago and similarly lived in a big city (NYC) and was making the move to VT for a simpler (and more frugal) life. I am now a proud VT resident likely not too far from your homestead. I’m in the Norwich area though with not even nearly as many acreage. I think I am going to vote for a goat to fill that pasture land. Sounds like you found the perfect place for your family! Finding something in VT that gives you land and privacy is so hard to come by without being miles away from “civilization”. Your patience and research certainly has paid off. Congrats! I haven’t been a regular reader for a while (super busy) so I just found out about your homestead purchase. Very exciting and looks nearly ideal! I’ll plug the Regenerative Agriculture group on Facebook as a great resource for everything from novice gardening to technical farming/permaculture questions. You need to live with the site for a while obviously but if you feel the need for outside eyes, you’re very close to one of the best land designers out there, Ben Falk. You mentioned frost dates. Dave’s Garden has an amazing tool that will give you tons of historical frost date data just by punching in your zip code. Happy homesteading! I could talk about plants for days, so feel free to email me if there’s anything I can help with. So cool! I just read your post on using PVC cellular trim to replace rotting wood. It was very helpful (not a single contractor we’ve used since moving North 4 years ago EVER mentioned it). What a coincidence that we live in Norwich, VT! Hope you like living here. I love it all – great property! It is my wish for my husband and I to have a house on some land one day – I would love being secluded and enjoying the peace and quiet. Currently we are in a very large city where all of the houses are practically on top of each other. Enjoy your homestead, thanks for sharing! It looks so awesome! Can’t wait to visit 🙂 It looks perfect for you guys! I haven’t read in a while, so I am a bit behind but congrats anyway! I’m happy to see that you found exactly what you wanted. Thanks again for letting us visit! Having now seen your place, it is everything you described in the post and then some. Gorgeous. Planning, patience and prudence have paid off! Welcome to Southern Vermont. We live in West Halifax and it’s pretty rural. We also live on 66 acres. Have you filed your homestead Declaration yet? Have you looked in the Current Use program? We’very been gardening and raising livestock for about 6 years now. Maybe longer. Hard to keep track. We are envious of your Internet as we can only get satellite. But, it’seems not bad. We have good neighbors and enjoy our privacy as well. Was thinking about atarting a homesteaders group around here. I know a few others who are interested in the same thing. We are in West Halifax also and would love to participate in a homesteaders group here. How can we connect with you? Thanks. What type of things would you be interested in seeing/learning/trying? I don’t “do” Facebook and there is a FB page for Vermont homesteaders. I have some contacts though, in the area. Farmers, event organizers (Strolling of the Heifers), and various hobbyists. I have experience with poultry raising and processing as well as basic food preservation techniques. Well, and food growing of course, although, I still have lots to learn…. Happened to find your page by chance and saw this story about your new homestead. 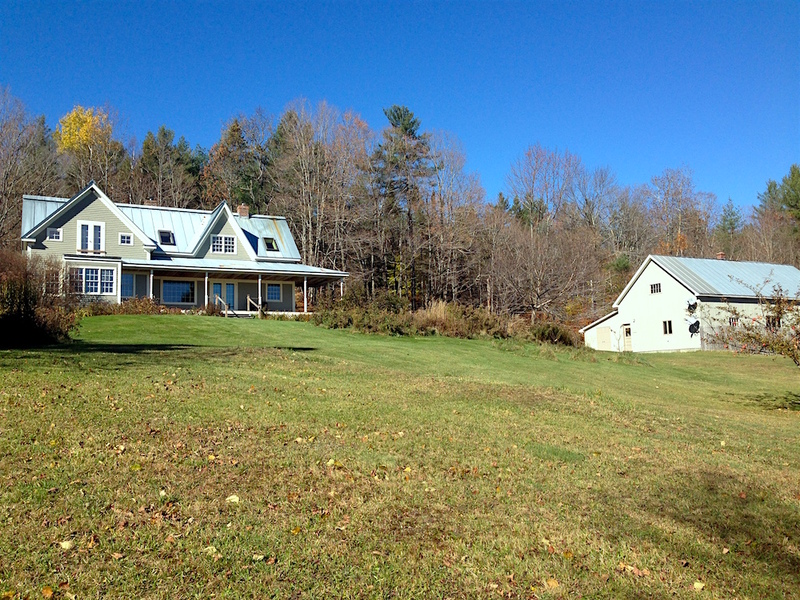 I might sound a bit bias, being a Vermonter myself I happen to think you found the ideal home for you and your family. Enjoy! Just finished reading your book which I loved! 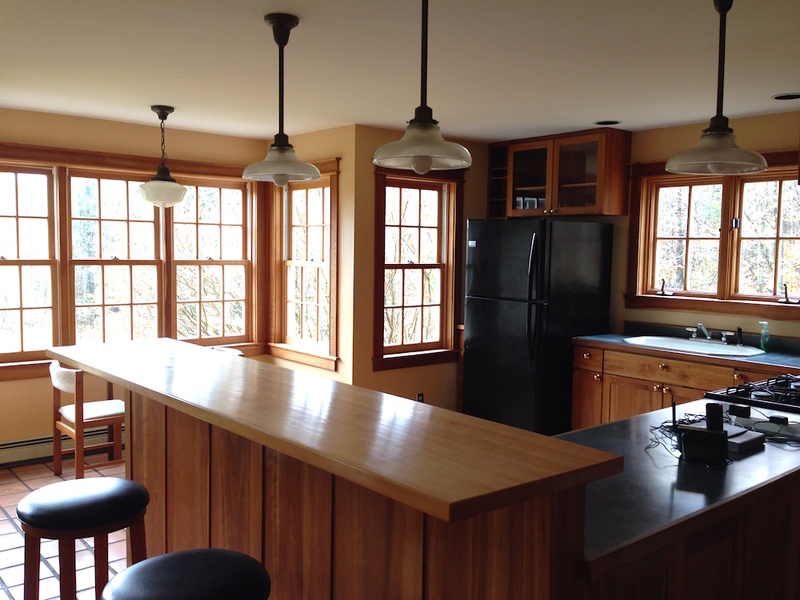 Enjoyed the pictures of your homestead especially all the windows in the kitchen. What incredible natural light. Kudos to you and your family for having a dream, creating a plan and then implementing it!! What an inspiration. Very curious if you considered buying a lot and building, and why/why not. The idea is enticing, especially being able to set up a house to be max efficient and not dealing with someone else’s senseless systems, but I guess I’d be afraid of overruns in construction. Interested in your thoughts.